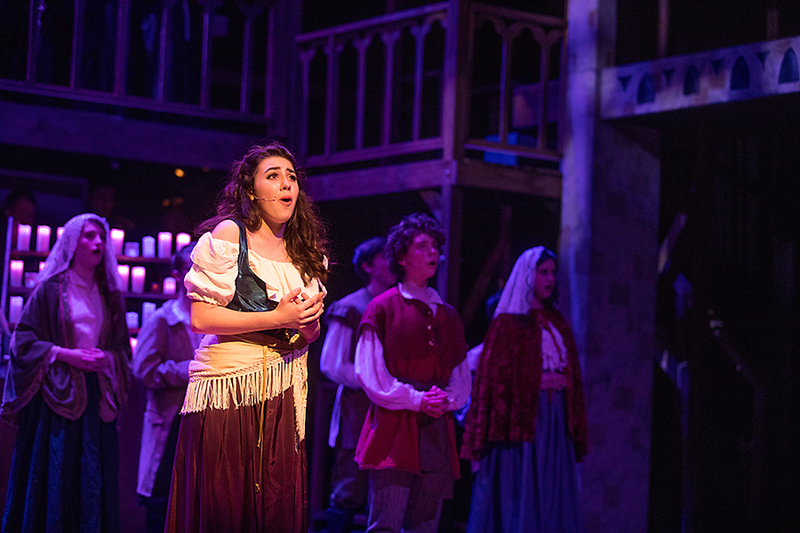 For over two decades Class Act Productions has astonished audiences in The Woodlands, Texas with the quality of its performances while becoming one of the most widely recognized and honored youth theatre programs in the nation. 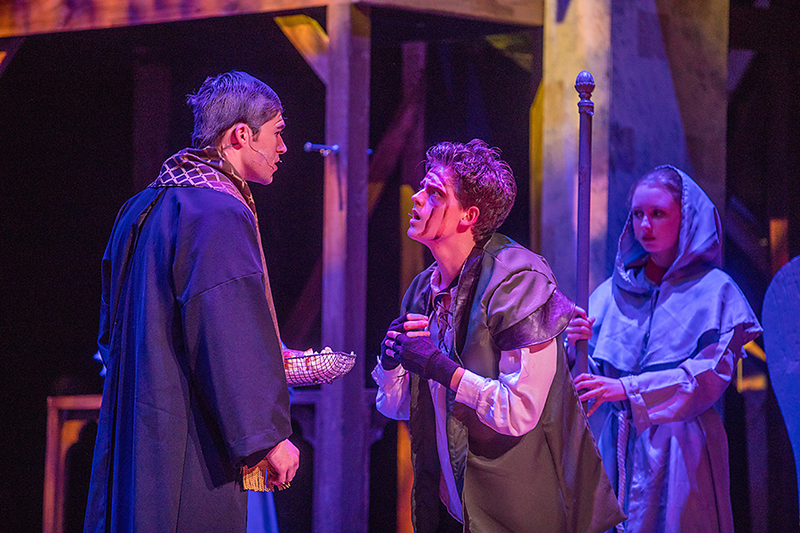 Skillfully directed by company founder/producer, Keith Brumfield, last weekend’s stunning performances of THE HUNCHBACK OF NOTRE DAME at The Nancy Bock Performing Arts Center, made it clear those accolades are well-deserved. With the music of Alan Menken, lyrics of Stephen Schwartz & book by Peter Parnell, the show is subtitled, “A NEW MUSICAL Based on the Victor Hugo Novel and Songs from the Disney Film.” This is an undertaking of enormous theatrical gravitas and musical complexity. It is amazing, but not surprising, that the incredible Class Act organization would dare to take on this challenge, and then succeed on such a grand scale. That scale is immediately impressive as the opening scene begins with the huge candlelit procession embracing the audience with the production’s extraordinary 38-member choir singing the beautiful Latin, “Olim” as it passes. Music Director, Rae Moses, presides over an equally extraordinary 12-piece orchestra for the rich opening number, “The Bells of Notre Dame,” all enhanced by the dependable Sound Designs of David Mallory. With a youthful cast numbering well over a hundred, the action plays out amid gorgeous candlelit interiors and colorful stained glass windows (Sets by Jonathan Shelledy, & Lighting by Blake Minor). The plot surrounds events in late 15th and early 16th century Paris where two orphans are given sanctuary by priests at the Cathedral of Notre Dame. One boy, Frollo (Brandon Brumfield) a pious and serious young man becomes a leading clergyman in the City of Light. Meanwhile his libertine brother, Jehan (Caleb Gurule) is cast out of the cathedral for his free-wheeling lifestyle and association with gypsies. Many years pass before Frollo, now a great leader in the church, is called to Jehan’s deathbed and learns his brother’s death will leave his deformed gypsy infant an orphan. When his brother dies, Frollo feels it is God’s will that he raise the baby. He names the child Quasimodo, meaning “half-formed,” but the hideous boy is kept hidden in the bell tower of the cathedral where it becomes his task to ring the bells. 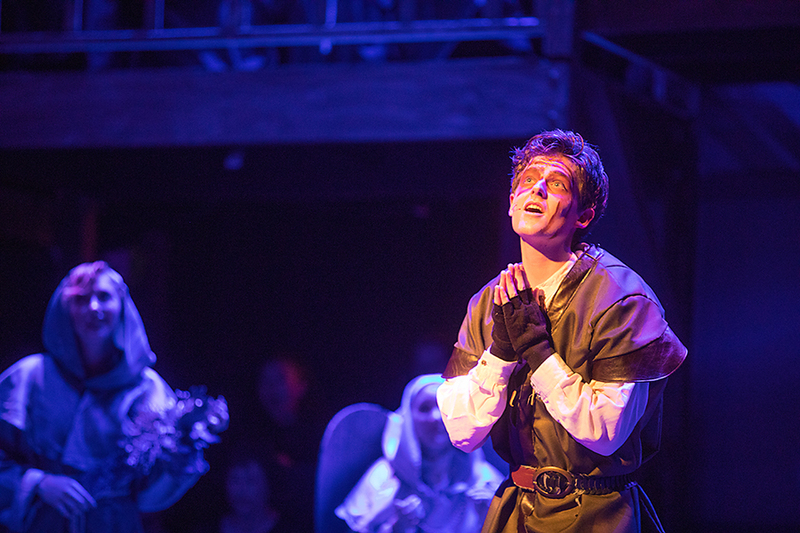 As a young man, Quasimodo (Jake Teall) longs to see the world and his desperation turns to song with the beautiful, “Out There.” He escapes into the city for the approaching, “Feast of Fools,” when even thieves, beggars and gypsies are allowed to roam the streets for a day. This brings us to the joyous gypsy song, “Topsy Turvy,” one of the show’s most opulent and delightful numbers with its bright music, colorful gypsy costumes (designers, Kristi Tabor & Laurie Lewis), and whirling and splendid dancing from the cast (Choreographer, Sinclair Sledge). 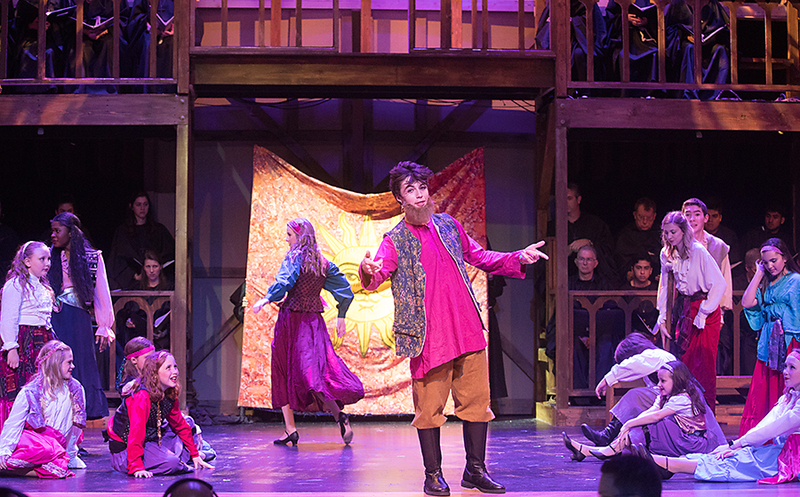 Anchoring that number is the explosive talent of young Peter McPoland in the role of the Gypsy leader, Clopin. He lights up the stage with his radiant energy. Then we meet the brash and handsome young soldier, Phoebus (Seamus Doyle), now returned from the battlefield and proudly singing of, “Rest & Recreation,” while hoping to become Captain of the Cathedral Guard. Meanwhile the gypsy revelry continues as the beautiful Esmerelda (lovely Sara Marie Wojta), enchants the crowd with her sassy and seductive dancing during, “Rhythm of the Tambourine.” Miss Wojta’s voice would soon enchant us further with songs like her dreamy, “Top of the World” (with Quasimodo and the wonderful cast of Statues and Gargoyles), as well as the whirling and mood-lightening joy of “The Tavern Song” (with Frollo & the gypsies). Mr. Teall hits a vocal homerun with the tender and romantic, “Heaven’s Light,” which deserved loud applause, but the audience was afraid to break the spell. Then, under blood-red lighting, Brandon Brumfield brought dramatic and vocal ferocity to the powerful, “Hellfire,” as Frollo warns all of the dangers of temptation. 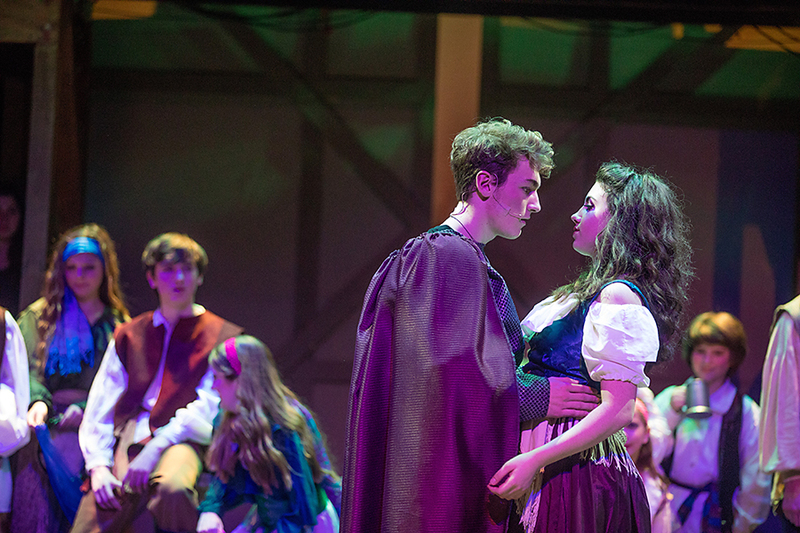 Both he and Phoebus are tempted by the seductive beauty of Esmerelda, who turns her kind attention to poor Quasimodo when he is mocked and abused by the crowd. 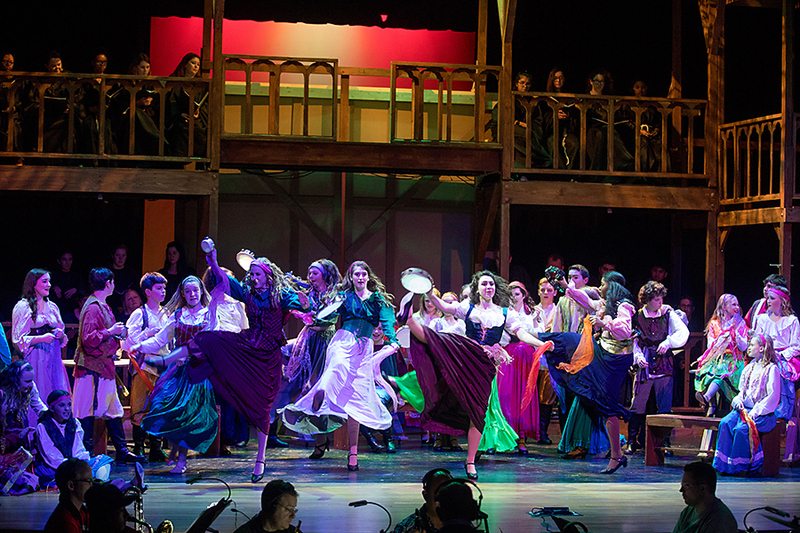 The rousing, full-company chorale of the song, “Esmerelda,” was a thrilling conclusion for Act One. Act Two, while dark at times, and without a typical “happy ending,” had delights of its own with Mr. McPoland ruling the stage once again as Clopin joins the gypsies for the explosive, “Court of Miracles.” The rich ensemble harmonies of, “In a Place of Miracles,” and the lush and romantic, “Someday,” duet from Esmerelda and Phoebus set a standard of excellence that would soon be capped by the marvelous full company, “Finale Ultimo,” sending everyone home on a cloud of memorable music. BRAVO! The columns of David Dow Bentley III have appeared on Broadway websites, in newspapers from the East Coast to the Gulf Coast, and may be viewed online at the website: www.ThePeoplesCritic.com. E-mail may be directed to ThePeoplesCritic3@gmail.com . This entry was posted in Broadway, BroadwayStars.com, Disney, The Courier Columns, ThePeoplesCritic.com, YourHoustonNews.com and tagged Alan Menken, Class Act Productions, Esmeralda, Hunchback of Notre Dame, Keith Brumfield, Peter Parnell, Quasimodo, Rae Moses, Stephen Schwartz, Victor Hugo. Bookmark the permalink. Bravo! Well done, Mr. Bentley. You should be writing for The New York Times. You certainly have the gravitas for it.